Points Nécessaires : 7350 Veuillez noter que, pour l'instant, vous ne pouvez pas télécharger du contenu à partir de notre plate-forme directement sur un appareil mobile (téléphone, iPod, iPad, tablettes ...). Vous devez télécharger vos articles sur un PC ou un Mac, puis de les transférer sur votre appareil de façon normale. Nous travaillons à autoriser le téléchargement direct aux périphériques mobiles, mais ce n'est pas possible dans la version actuelle de la plate-forme. Désolé pour le dérangement! NOTICE: Activation key must be used on a valid Steam account, requires internet connection. DELUXE EDITION	The Deluxe edition includes the following: Warlord Robe Set Magicka Orchestra Soundtrack Digital Interactive Map Cultist Robe Set	ABOUT THE GAME	The world's most irreverent co-op action adventure returns! In the next chapter of Magicka, players ascend from the ruins of Ald… rheim to experience a Midgård almost wiped free of Wizards after the Wizard Wars, with the few that do remain having either gone mad or extremely hostile toward all others. 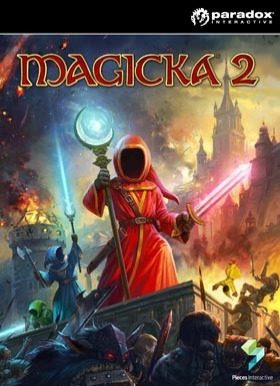 To rid the world of evil, again, up to four Wizards, and their guide Vlad, will traverse Midgård armed with the next iteration of the famous Magicka dynamic spellcastingsystem, as players reprise their roles as the most overpowered, unpredictably funny Wizards ever known to fantasy! KEY FEATURESLearn to Spell Again As an all-powerful Wizard, you will have thousands of spells at your fingertips to experiment and defeat evil with, use them together with special Magicks to annihilate foes or give necessary aid to your companions. Combine up to five elements at a time and work together with—or against—your friends for that full Magicka co-op experience. Four Player Friendly Fire Compatible Co-op Full co-op support! All levels and game modes in Magicka 2 will be supported for four player co-op with hot join, checkpoints, and other supportive features and functionality. Friendly fire is always on, promoting emergent gameplay humor as players accidentally hurt or kill their friends in their attempts to annihilate enemies. Overcome insurmountable odds to beat the Challenge mode.Be the Wizard You Want to BeWith tons of robes, staffs, and weapons you can play as the robed Wizard of your choice to wreak havoc amongst hordes of fantasy creatures as you see fit. Magicka 2's dynamic spellcasting system can be used in many different ways, offering hours of experimentation for players to figure out which spells belong in their repertoire. Add both co-op and friendly fire on top of that and you have a recipe for hilarious disasters. Replay the Next Chapter with Artifacts	Magicka 2 offers players a story-driven campaign mode set in a lush fantasy world influenced heavily by Nordic folklore. New to the franchise are Artifacts, which act as different switches and options for players to customize and change the gameplay experience, adding more replayability when utilized. SYSTEM REQUIREMENTS Windows	Minimum: OS: Windows 7 or Windows 8 Processor: 3GHz Dual Core (Intel Pentium G3220 or higher / AMD A4-4000 or higher) Memory: 2 GB Graphics: Nvidia GeForce 550 or better / ATI Radeon HD 5850 or better Hard Drive: 3 GB available space Sound: DirectX Compatible Sound CardRecommended: OS: Windows 7 or Windows 8 Processor: 2.8GHz Quad Core (Intel Core i5-2300 or higher / AMD A8-3850 or higher) Memory: 4 GB Graphics: Nvidia GeForce 640 or better / ATI Radeon HD 6670 or better Hard Drive: 3 GB available space Sound: DirectX Compatible Sound Card	Mac OS	Minimum: OS: OSX 10.7 Processor: Intel Core i5, 1.7GHz Dual-Core Memory: 4 GB RAM Graphics: Intel HD Graphics 4000 Hard Drive: 3 GB available space Recommended: OS: OSX 10.7 Processor: Intel Core i5, 2.5GHz Memory: 4 GB RAM Graphics: Radeon HD 6750M Hard Drive: 3 GB available space Linux	Minimum: OS: Ubuntu 12.04 Processor: Processor: CPU: 3GHz Dual Core (Intel Pentium G3220 or higher / AMD A4-4000 or higher) Memory: 2 GB RAM Graphics: Graphics: Nvidia GeForce 550 or better / ATI Radeon HD 5850 or betterRecommended: OS: Ubuntu 14.04 LTS Processor: Processor: 2.8GHz Quad Core (Intel Core i5-2300 or higher / AMD A8-3850 or higher) Memory: 4 GB RAM Graphics: Graphics: Nvidia GeForce 640 or better / ATI Radeon HD 6670 or better	© 2014 Paradox Interactive ® MAGICKA ® is a registered trademark of Paradox Interactive AB. All rights reserved.